Hi, I am a student at Swasnea University trying to visualise some data from project Tycho(https://www.tycho.pitt.edu/dataset/US.36989005/). Below you can see my visualisation of a stacked area chart comparing the number of mumps cases across each state in the US. Unique Observation : From the visualization we learn that cases in Mumps fluctuated between the years of 1968 and 1981, particularly between the years 1968 - 1972. This may be because the vaccine for mumps was introduced in the year 1967. We can also learn that the states Wisconsin, Texas and California have the highest recorded cases for mumps in that order. Data Preparation: . No additional columns were added to the data file but the number of states were filtered after uploading the data to tableau to reduce the number of states included in the dataset. My question is how can I improve this visual design? But also what other visual designs do you think would be better suited to visualise this dataset? There are five peak periods. With the plots, one can see Wisconsin was affected in the four periods. Possibly Illinois was affected the 5th period (some colors are too close to each other). You perhaps have noticed that the big distortion of a time series at a lower position makes the perception of the time series at a higher position hard. 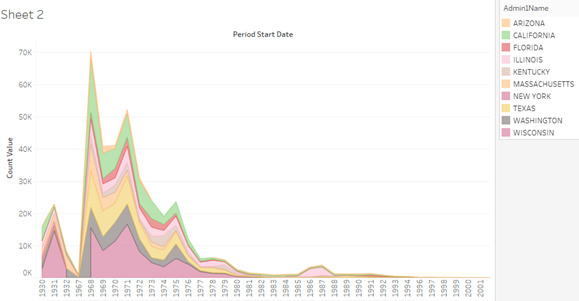 So one cannot judge how, e.g., CA, was affected in these periods. There are alternative visual representations that may address this issue.